The OVA is a civic society founded in 1979 to interest residents and visitors in the history, geography, natural history and architecture of this area of Devon. Read a brief history written in 1996, by Charles Snow, of the founding of the OVA here. 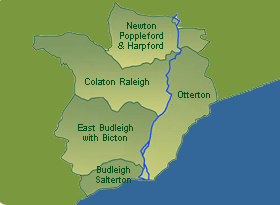 The OVA covers the area of East Devon from Newton Poppleford and Harpford to Budleigh Salterton following the River Otter down to the sea. We are registered with the Charity Commissioners, and our "area of benefit" is the countryside of Budleigh Salterton, East Budleigh with Bicton, Colaton Raleigh, Newton Poppleford and Harpford. The Association maintains contact with the County, District and Parish Councils, as well as neighbouring associations with similar aims. 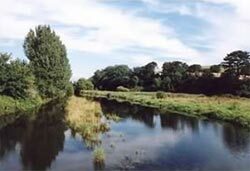 It also works closely with the East Devon Area of Outstanding Natural Beauty (AONB) Partnership. The talks programme covers a wide range of interests concerning the countryside such as archaeology, architecture, wildlife and flowers, farming and forestry, as well as down to earth problems such as water supply and quality. Walks are arranged each month and introduce members to the beauty of our countryside available to them through the many excellent footpaths. Members also receive four newsletters a year. You are particularly welcome to join the Association if you take a positive role in achieving its objectives, but we are also very glad to have members who can show their support only by subscription or donation. Anyone who is interested in the Otter Valley may join wherever they live.